Terence Alan Patrick Seán Milligan, known as Spike, was a comedian, writer and musician. He was of Irish descent, but spent most of his childhood in India and lived most of his later life in England, moving to Australia after retirement. He is famous for his work in The Goon Show, children's poetry and a series of comical autobiographical novels about his experiences serving in the British Army in WWII. 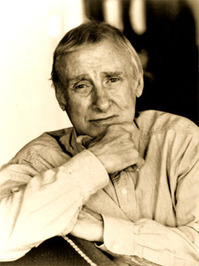 Spike Milligan suffered from bipolar disorder, which led to depression and frequent breakdowns, but he will be remembered as a comic genius. His tombstone reads 'I told you I was ill' in Gaelic. I'll draw a sketch of thee. What kind of pencil shall I use?